With Medicare there are several different pieces to understand and it can get confusing. Senior Savings Services provides a full explanation of what all the pieces mean so you can make the best decision for yourself. The diagram below helps visualize the different ways to receive benefits. Learn more about each area below. No fee to simply carry Part A if you paid into Medicare or married to someone who has paid Medicare taxes while working. Inpatient Hospital Deductible for 2019 in the amount of $1,364 for days 1-60. Then $335 copay per day for days 61-90. And $682 for each “lifetime reserve day” after day 90 for each benefit period. A benefit period begins the day you are admitted into the hospital; the benefit period ends when you haven’t received any inpatient hospital care or inpatient skilled nursing care for 60 days in a row. If you are admitted back into the hospital after one benefit period has ended, you are now in a a new benefit period and you are responsible for a new Part A deductible. There is no limit to the number of benefit periods. There are up to 60 lifetime reserve days in your lifetime. Skilled Nursing Facility for 2019 each benefit period of $0 copay for days 1-20 provided had been an inpatient in the hospital at least 3 consecutive days prior, $170.50 per day for days 21-100. After day 100 you are responsible for all charges. Hospice Care for 2019 has $0 copay. Monthly Premium to carry. If you started Medicare in year 2016 or after your Part B premium is $135.50 monthly. 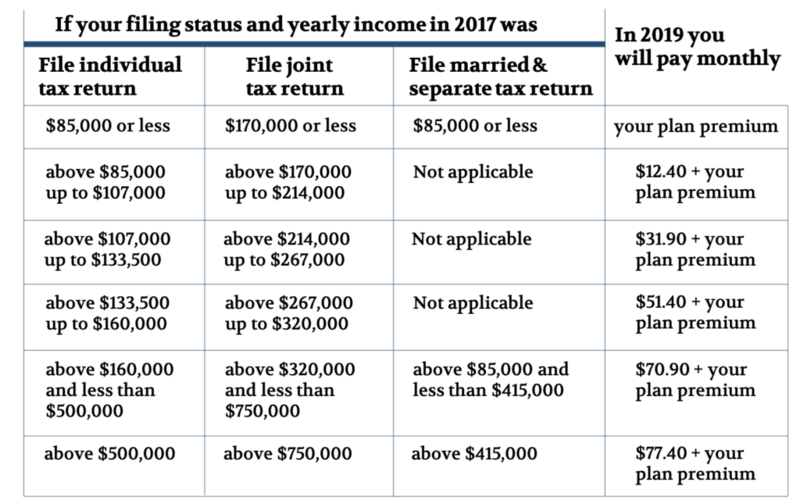 Further, if your modified adjusted gross income is above certain limits you may pay more. See Medicare Part B Monthly Premiums by Income below. Medical and Other Services you will pay 20% of the Medicare-approved amount. This includes doctor services, outpatient therapy, and durable medical equipment. There is no limit to how much those expenses can be for you. To avoid having to pay the Part A and Part B deductibles and co-payments is the reason to carry a Medicare Supplement Plan. 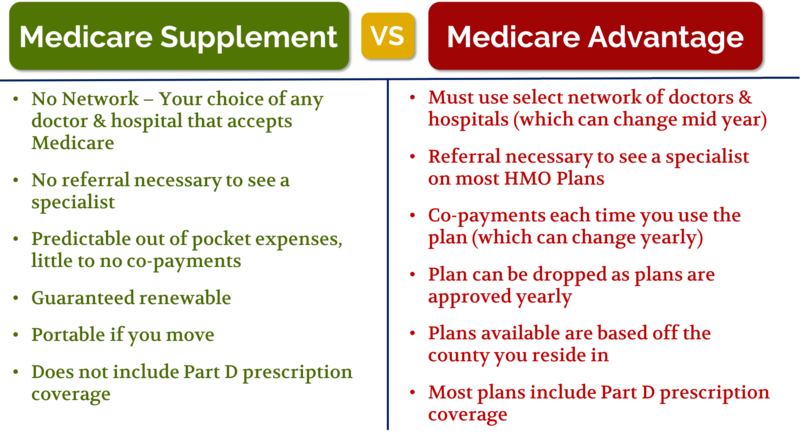 A Medicare Supplement Plan is designed to pay expenses a Medicare eligible individual would otherwise be responsible for under Original Medicare. 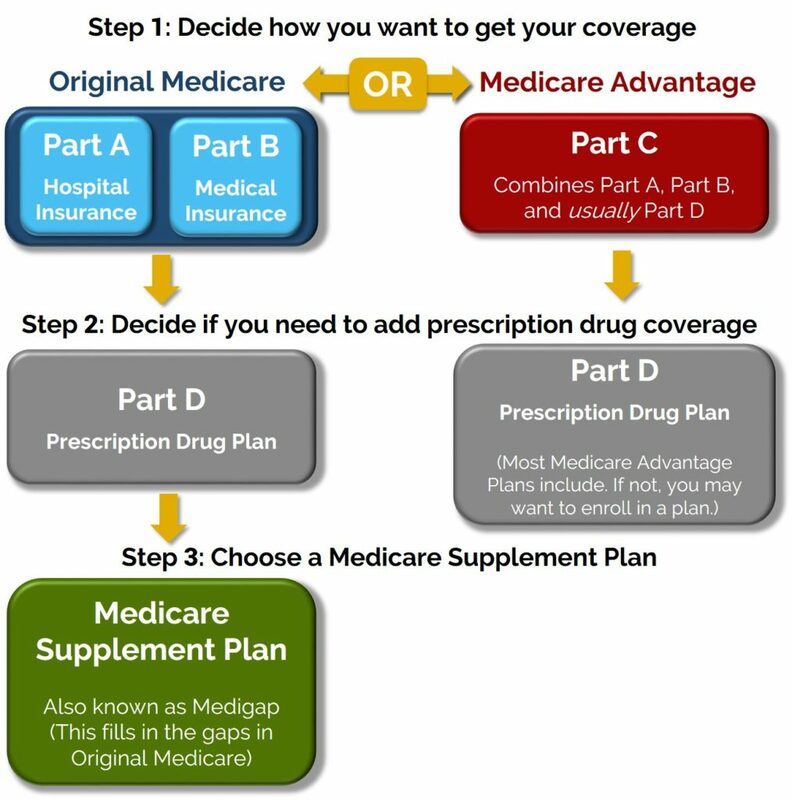 All Medicare Supplement (Medigap) plans are standardized, which means a letter plan that is offered with one company is the same with any other company. Also, different insurance companies may charge different premiums for the same exact plan. 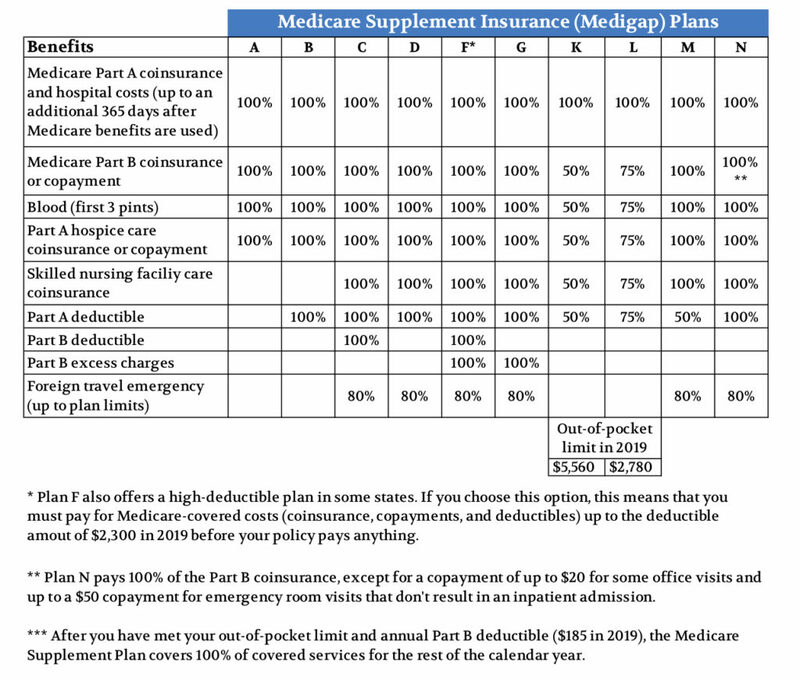 This information can be referenced on page 70 of the 2019 Medicare & You handbook and also on page 9 of the current Guide to Choosing a Medigap Policy publication. There are ten different types of plans to choose from which are shown in the chart below. With a Medicare Supplement plan you can go to any doctor or hospital that accepts Medicare. You can enroll in or change a Medicare Supplement plan any time of year. Senior Savings Services can explain what each of these plans will provide. A Prescription Drug Plan, known as Medicare Part D, is a plan that is designed to help protect against having to pay the full cost of a prescription. It is advised to enroll in a plan. If you don’t enroll in a Prescription Drug Plan when you are initially eligible you can be charged a late enrollment penalty. This penalty equates to about $0.34 for each month you have not been enrolled in a plan. The amount of this penalty gets added onto the monthly cost of the Prescription Drug Plan you enroll in and never goes away. If your modified adjusted gross income is above certain amounts you may pay more for a Prescription Drug Plan. See chart below. Medicare Advantage Plans are offered by private companies approved by Medicare. These plans include HMO (Health Maintenance Organization) or PPO (Preferred Provider Organization). These plans must cover all services that Original Medicare covers and often includes a Prescription Drug Plan. Often Medicare Advantage plans have a network of providers you must use except in emergency situations. The list of providers to go to within a plan can change throughout the year. Senior Savings Services highly recommends that if you choose a Medicare Advantage plan you review the costs you could be charged. Review costs for items including but not limited to inpatient hospital costs, outpatient surgical costs, emergency room visit, cancer radiation and chemotherapy treatments. The plan will send you an Evidence of Coverage or Summary of Benefits book which shows what you are responsible for. 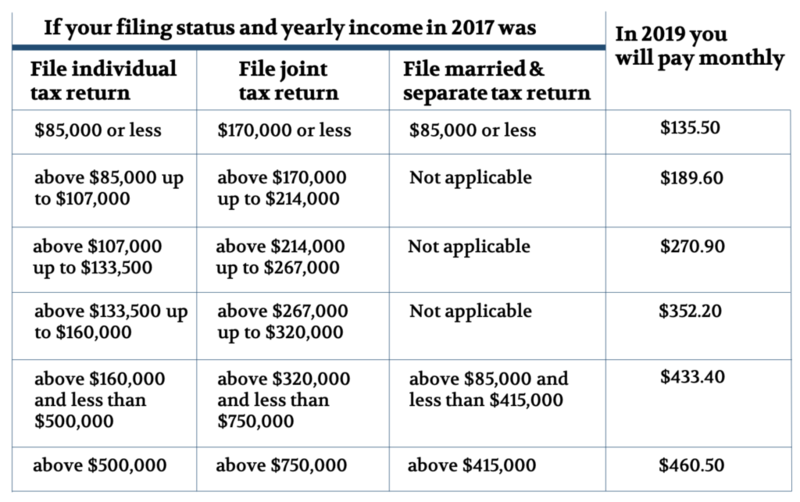 The plan premium and copays can change from year to year. There are ways to help offset the copays of a Medicare Advantage plan if you have one. To learn more about your options call 1-800-592-0819 or click Get a quote. What is Medicare Annual Election Period? This is a yearly period of time that is October 15th – December 7th you can enroll in or make changes to a Medicare Advantage Plan or Prescription Drug Plan. Any changes you make to these plans during this period of time will start January 1st. It is recommended comparing plans during this period of time as prescription copay amounts can vary widely from plan to plan. It is not uncommon to see substantial differences from one plan to the next if you are taking multiple medications. During the Annual Election Period, if you have a Medicare Advantage plan you should review the cost in premium, deductible, and copayments for benefits including but not limited to inpatient hospital costs, outpatient surgical costs, physical therapy, cancer radiation, and chemotherapy treatments. Also, while they can change at any time, confirm your doctor and hospital are in network. Contact Senior Savings Services at 1-800-592-0819 to review the options in your situation.